In Fürstenfeld, players are trying to build their palace. To do this, they build buildings so they can harvest hops, barley and water to sell to the breweries for cash. 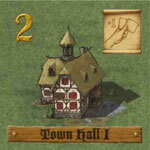 Each round players draw buildings cards, produce goods, sell goods, build buildings, and discard cards. It sounds, and is, simple but there are several interesting game mechanics at work. 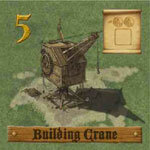 First, each player has a board with spaces for 6 buildings and, once they have built 6 buildings, any new buildings must be built over an existing one. Second, each player has their own deck of building cards and they draw a few cards each turn; however, they can only keep one card (sometimes more with certain buildings) into the next round. Any discarded cards get placed under their draw pile so may appear again later in the game. 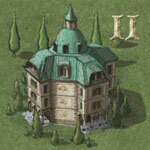 Third, the first player to build all 6 buildings that make up the palace wins but the palace buildings give no benefit of any type. The economy for selling goods has an interesting system too. Each brewery on the board has a demand for a fixed number of each good (hops, barley and water). For each item not received that round, the price goes up 1 space. So, if a brewery wants 3 water and only receives 1 then the price will go up 2 spaces. A player can sell a brewery more of a good than the demand, but after the sale the price goes down 1 space for each unit over their demand. Fortunately, the price goes down after selling so the next person to sell to the brewery will have to deal with the lower price. 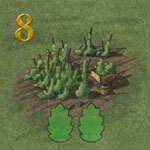 (If memory serves, a player can only sell to one brewery so can not pick to sell water to one and hops to another). I enjoyed the gamer up until the final stages. There is a very nice balance to the building board – you constantly juggle the different buildings to gain special benefits as well as producing as many goods as possible. Also, as you can only keep a few building cards each round, you have to make some very difficult choices about which cards to keep because you don’t have the money to build it yet and may not see that building again for some time. Jostling for turn order was interesting too. The decision-making about which cards to build, keep and discard was very entertaining. I found I spent more time working on my building mixture and less looking at market prices for the goods. I found if I produced goods, I could usually find a decent income for them – maybe because I tried to produce goods other players were not, or tried to sell them before another player did – this may have been more difficult with more players. Also, I liked the decisions required on when to build the palace buildings as each one takes up valuable space on the building board with no benefit. Player interaction was mostly based on selling to breweries as you could affect prices and sell to a brewery that another player would have found useful. Watching what goods others were producing was helpful but interaction felt relatively low. However, the final stages of the game were less satisfying. The key problem with our game was that we were all just waiting to draw our final building card. We all had stacks of money and had built 5 of the 6 buildings. So, the first player to draw just their last palace card would win. This was rather anti-climactic. Maybe in future games we would use the buildings that allow you to keep extra cards more later in the game, although it’s only useful to keep palace cards if you can afford the space on your board and the cost to build them. However, I’m not sure that would fully address the issue because you can still draw several victory building cards at once and often there’s no way to keep them all so you have to wait until the deck cycles through before you can get at them again. So, it felt like the luck of the draw could affect the outcome a lot. This may just have been because we were new to the game and we’d play differently in future. 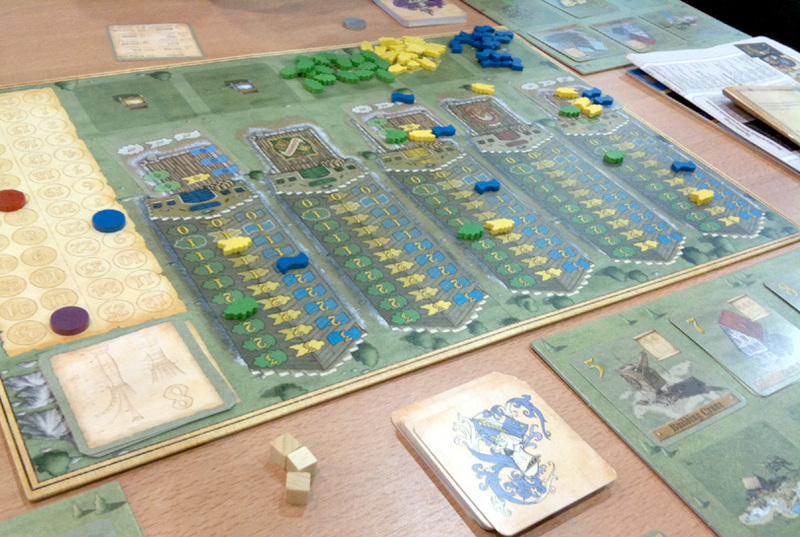 Friedemann Friese designs a lot of good games (Power Grid, Factory Manager, Black Friday and many, many others) but Fürstenfeld wasn’t one that resonated enough with me. Apart from the last stage, it was entertaining to play (as I like the game mechanics that are present) and I would play it again should someone bring it to the table, but the impression that the order of the building decks plays a big role means it’s not high on my priority list. 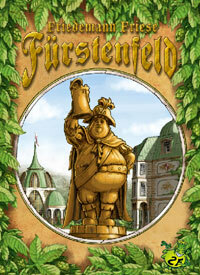 This entry was posted on Tuesday, December 7th, 2010 at 1:04 pm	and is filed under Board Game Review, Board Games, Essen Spiel 10, Furstenfeld. You can follow any responses to this entry through the RSS 2.0 feed. You can leave a response, or trackback from your own site. So I’m curious if you played with the “advanced” version, which Friedemann says is the “normal” mode for the game? We played without the advanced rules. The advanced rules say you have to place the 6 palace sections on specific spaces on the board when built, and they allow you to put the first 9 tiles in your draw stack in whatever order you want. These extra rules require some knowledge of the tiles beforehand so we played without them as it was our first time but I like the idea of them. However, I don’t think the advanced rules would have solved my issues with the end of the game.